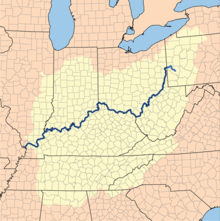 Map of the Ohio River and its basin, or the land that it drains. The Ohio River is the one of the most important tributaries to the Mississippi River. It is 981 miles long and it forms boundaries for the states of Ohio, Kentucky, Illinois, Indiana, and West Virginia before finally going to its headwaters in Pennsylvania. It is its widest a little to the West of downtown Louisville, where it is one mile wide. Cities on the Ohio River include Paducah, Kentucky, Cincinnati, Ohio, Pittsburgh, Pennsylvania. The river begins in Pittsburgh. The Wabash, Kentucky and the Tennessee Rivers flow into the Ohio. Ohio River Forecast Center, which issues official river forecasts for the Ohio River and its tributaries. This page was last changed on 17 January 2019, at 07:17.